Henry Pittock was a visionary entrepreneur and early adopter of technology—traits that are now serving as inspiration for Pittock Mansion’s new strategic plan for enhancing the visitor experience. While Henry’s embrace of Industrial Age innovation led him to build an architecturally impressive house with the latest technology, bringing that formerly state-of-the-art technology to 21st-century standards presents challenges. It’s not as simple as ripping out the old and replacing it with the latest and greatest. So, how does a historic house museum get a much-needed technological upgrade? Carefully and thoughtfully. The Mansion’s architect, Edward Foulkes, had experience designing commercial buildings outfitted with the latest conveniences. 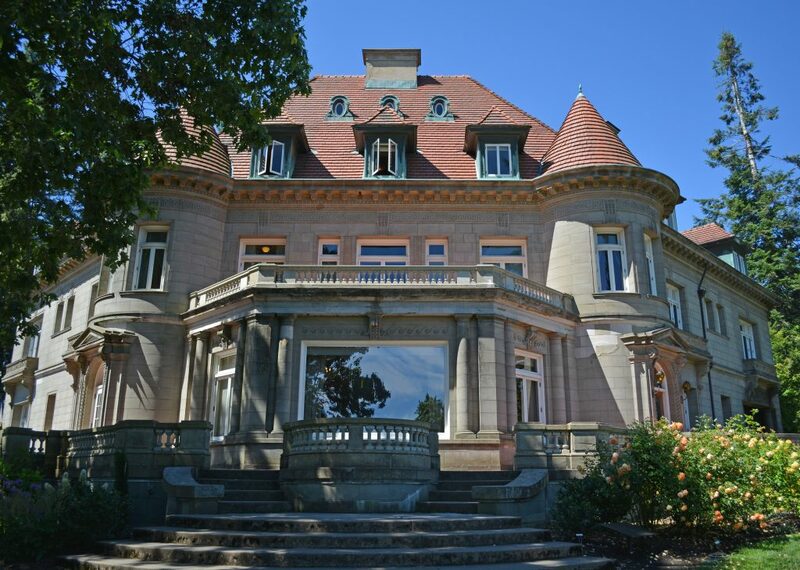 Foulkes designed Pittock a very modern home by 1914 standards that included innovations such as thermostat-controlled central heating, elevator, electric dumbwaiter, Western Electric intercom system, central vacuuming, refrigerator room, and elaborate showers. Most of the innovations listed above required a source of energy, and in 1914, the “way of the future” was electricity. An original fuse box (left) and original electrical switchboard (right). While the Mansion’s original electrical panel was more than strong enough to support the home’s original electrical needs, the transition from family home to historic house museum has necessitated adding computer workstations and office equipment. As the number of workstations and equipment increased, so have signs that the electrical system is taxed: regular office activities on the Mansion’s third floor sometimes blow fuses; lights in the office space above Admissions dim when printers turn on; and outlets on both the third floor and in the Garage are at capacity, preventing the Mansion from adding more workstations for new staff as the team grows to accommodate the museum’s increasing visitation. 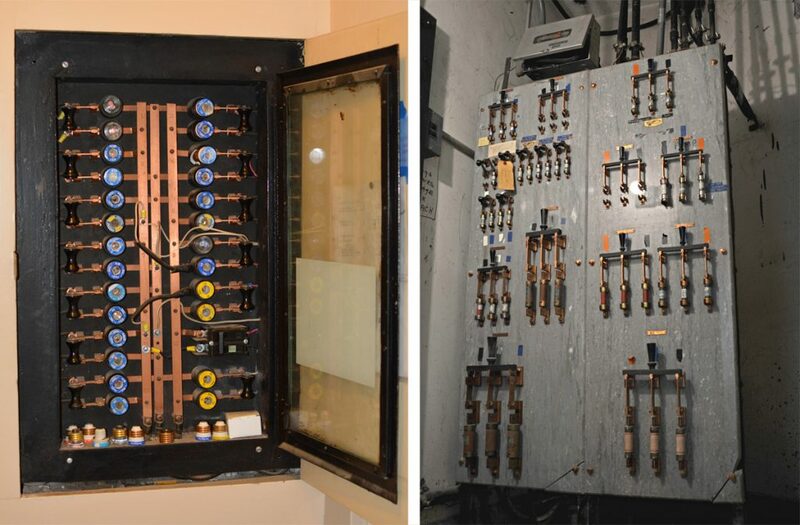 This spring, as a first step to finding a solution for the electrical system, On Electrical Group (OEG) conducted a pro-bono circuit tracing of our electrical systems. The goal was to evaluate current concerns, determine if they pose safety risks, and present suggestions for resolving the issues, keeping in mind the site’s historical preservation requirements. OEG found the Mansion’s third floor has adequate power for our current usage and can accommodate additional workspaces once circuit use is reorganized; currently, some circuits are overloaded, while others are underutilized. In the Garage, OEG found an appropriate number of circuits feeding the Museum Store, Admissions, and second floor office space, but the main feeder in the basement of the Mansion is undersized for the number of electric loads added to the Garage over the years. This is not a safety concern, but it indicates the Garage is at maximum capacity. Additional workspaces cannot be added until the existing conductors in the Mansion’s basement are replaced with larger ones, which is an expensive endeavor. As a result, the Mansion is examining options and working on a plan of action. 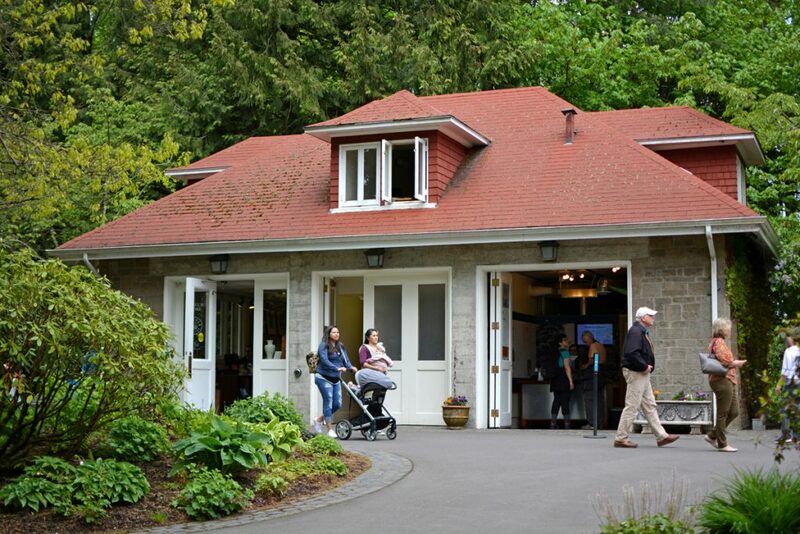 Another obstacle to providing a 21st-century museum experience at Pittock Mansion is an outdated and underpowered internet connection. If Henry Pittock was living in the Mansion today, it is likely he would insist upon the highest speed internet available! However, due to the Mansion’s remote location, the infrastructure necessary to upgrade to high speed internet is not readily available. Circuit tracing discovered work is needed before adding new electrical loads to the Garage. The under-powered internet connection causes a number of operations problems: it slows the processing of credit card payments, thereby increasing visitors’ wait time at Admissions; it prevents us from updating to a state-of-the-art point of sale system with online ticket sales and gift card capabilities; it is too weak to support multimedia presentations, limiting our programming options; and it prohibits the Mansion from providing WiFi for visitors. After months of research and negotiation, the Mansion has recently reached an agreement with Comcast that will bring high speed internet infrastructure up to the Mansion. Once installed, the Mansion will have the high speed internet connection necessary to work on the technology-based visitor experience enhancements outlined in the strategic plan. Henry Pittock built a technologically advanced modern home for himself and his family. As a result of his forward-thinking, the Mansion had the technological infrastructure necessary to transition to a historic house museum. And now, thanks to OEG and Comcast, the Mansion has begun its transformation into a 21st-century museum. Stay tuned!